It’s extremely rare in India to recover a stolen vehicle, let alone in a time of less than three months. In March, a Chevrolet Beat car was stolen from the IP Mission school street of Muglisara area of Surat. The city police registered a case of vehicle theft and it subsequently recovered the vehicle in three months. But how did this happen? Thanks to the picture intelligence unit, PIU, the Surat police can now detect an individual or a vehicle sitting in the control room. 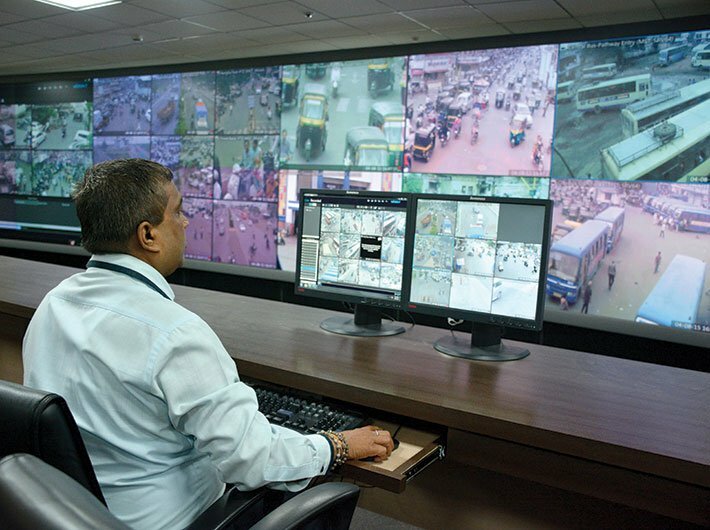 Surat police operates a network of 604 cameras in 114 different locations (covering 10 percent of the city) to crack down on street crime and crime against women. The PIU, launched on July 19, uses advanced video analytics software which matches a person or a vehicle's number plate appearing in the camera frame against individuals/ vehicles blacklisted. The software is also known as facial recognition and automated number plate recognition (ANPR). The PIU includes software for detecting cases of over speeding as well. The trial-run of the PIU was started in June, two months after the car theft incident. On July 11, the registeration number of the stolen car was fed into the PIU system. “The very next day the ANPR software generated an alert about the stolen vehicle,” said an official working at the command and control centre of the Surat police. The cops found that the vehicle was moving between Chowk and Hodi Bangla areas; CCTV cameras cover both these locations. In between, however, there were no cameras. As soon as software generated an alert, the command centre informed the local beat constables and the vehicle was recovered within four days. “The use of surveillance and analytics leads to easy detection of criminals and it acts as a huge deterrence,” Rakesh Asthana, Surat police commissioner, told Governance Now. Asthana’s office room and command and control centre are co-located on first floor at the commissionerate. Mere use of cameras, said Asthana, has yielded significant results for the police and the people. It has been found that in crime-prone areas where CCTV cameras were in use, the number of cases has gone down by 27 percent. Asthana added that cameras footages have helped in solving 150 serious cases related to murder, kidnapping and hit and run. The petty crime has gone down to zero or negligible value. Surveillance and analytics technologies have led to a sense of security among citizens, the commissioner said. Asthana hopes that the application of advanced analytics, including facial and number plate recognition, will lead to reduction in time taken in crime detection and investigation. The command and control centre bears a look of a war room. Machines occupy almost half of the space of the centre: stacks of servers, cables, power backup, video screen cubicles and computers. To avoid over-heating of machines, temperature is kept at 20 degree celsius. The centre has separate rooms for teams handling Dial 100, police control room, PCR van, and video wall monitoring. The video wall room occupies the maximum space. Three teams, each having 12 policemen, work in shifts to oversee the video wall. Eighteen cubicle screens constitute the video wall, which is 40 feet by 7 feet in size. The screen acts as a display for 604 cameras placed in 114 locations in the city. These screens have been running nonstop for over two and a half years and will continue for another two and a half years, said officials at the command centre. Then there is a strategic room, which is used for planning security on important occasions, like festivals and rallies. The video analytics trial run was done in the strategic room. Surat police already has a digitised database of 18,000 criminals, called master criminal record, which has name, image and crime history, among other things. Some of these blacklisted names fall in wanted and most wanted categories. All these names have been fed into the PIU for facial recognition application. Every time one of these images appears the analytics software gives an alert. The software, however, doesn’t give a 100 percent confirmation about the identification. The software matches an image from the blacklist category to the images appearing in the camera and gives a percentage of the resemblance. Officials using the analytics at the command centre say if images resemble by 80 percent they know it is the same individual. “In indoor, controlled environment – for example railway and bus stations and malls – the software gives better results,” said Asthana. As of now, seven cameras deployed at railway and bus stations, are being used for facial recognition. The system captures the movement of these people whenever they appear in the camera. The police can easily find out how many times an individual has passed through these cameras. Similarly, the number plate recognition software matches the number appearing in the camera with the blacklist and accordingly generates an alert. At present, the blacklist database includes 350 number plates. Seven cameras placed at Saroli checkpost and Athwagate are used for ANPR software. The ANPR also helps ascertain the fact that a number plate belongs to the same vehicle. The system searches for other details and attributes associated with the particular number from the vehicular database. The police has also mounted four cameras and infrared devices around Iskcon mall to detect over-speeding and identify the number plates at night. The project is being implemented in a phase-wise manner. By mid-next year, the police plans to add 900 cameras. It wants to increase the number to 2,500 in another one year. This is part of the second phase of the project. In the third and last phase the police wants to increase the number of cameras by 5,000 and use analytics over 200 of them. The Surat police also plans to build a disaster recovery site. At present the police has spent over Rs 37 crore on the project. The cost of PIU (analytics component) is Rs 1.18 crore. Delhi and Mumbai, cities that are several times bigger in size and population vis-à-vis Surat, don’t have such systems in place. It is only now that Mumbai police is implementing surveillance and analytics project, after four failed attempts. So what is the mantra of the Surat police? Asthana said it is the political buy-in and public participation. No doubt the Surat police was smart enough to get a political heavy weight for endorsement at different phases of the project. Narendra Modi, the then chief minister of Gujarat, inaugurated the project on January 18, 2013. When the city police had to launch PIU, it got Anandi Ben Patel, the present CM, for the inauguration.